Few cars get close to the style and class of an Aston Martin, but thanks to its appearance in Goldfinger the DB5 has been elevated to mythical status. The standard DB5 coupe came with a 3,995 cc straight-6 engine with a top speed of 145 mph and could accelerate from 0-60 mph in 7.1 seconds. In addition to the coupe it was also available as a convertible and a DB5 Shooting Brake was also produced, although the rear suspension remained unaltered and it was unstable when cornering at high speed. A total of 1,021 Aston Martin DB5s were made and thanks to the demand created by its association with 007 prices range anywhere from $250,000 to $2 million, depending on the year and the condition of the car. The company was founded in 1912 as Bamford and Martin by Robert Bamford and Lionel Martin, but the company was constantly plagued by financial problems and Bamford and Martin both left. After being saved in 1926 the buyers renamed the company Aston Martin and focused on producing two-seater sports cars until World War II; the company’s last pre-war design was called the Atom, and remained a prototype throughout the war. When David Brown test-drove the Atom after the war he was so impressed he decided to buy the company. Brown had made his money by manufacturing tractors and in 1947 he bought Aston Martin for £20,500. Although visually unlike and previous or future Aston Martin, the Atom’s chassis was very much the basis for all the company’s post-war up to the DB mark III and consisted of a space-frame superstructure of square section tubes with aluminium body panels attached to body tubes. Brown also bought Lagonda and took a 2-litre roadster based on a the Atom into production after combining workshops and resources; however, only 15 were ever sold between 1948 and 1950. The next car was the first to bear the initials “DB” after David Brown. The DB2 sported a 2.6 litre dual overhead cam straight-6 engine and its success at Le Man ensured it was also a commercial success; 411 cars were sold between 1950 to 1953. Meanwhile on the racetrack the 1951 DB3 racing car had varying degrees of success at Le Man, Silverstone and Goodwood. The DB2/4 followed in 1953 with wraparound windscreen, larger bumpers, and repositioned headlights; and on the racetrack people started to take notice of the DB3S when it started winning trophies; Le Mans was the only race in 1953 not to be taken by the Aston Martin DB3S, the first car to sport the now familiar Aston Martin front grill. The Mark II was introduced in 1953, the most significant change being the manufacture of the body by Tickford coachbuilders, which Brown purchased the company in 1954; and the 1957 DB Mark III was Aston Martin’s first production car to feature the new radiator grill and powered by a Lagonda 2.9 Litre straight-6 engine 162 horsepower engine it could reach 120 mph. This was the car that James Bond drives in the novel Goldfinger, although Ian Fleming mistakenly calls it the DB III, and is the only car in the books to have any gadgets; the main one was a homer that allowed Bond to gauge his distance from Goldfinger’s Rolls Royce when trailing him through Europe. The DB4 followed in 1958, a sleek, Italian-styled 3.7L sports coupe that really established the reputation of the company. That reputation was later set in stone with 1963’s DB5, later dubbed “the most famous car in the world” after its appearance in Goldfinger. The car used in the film was the DB5 prototype, with another standard car used for stunts and two more modified cars for publicity tours after the film was released. James Bond’s Aston Martin DB5 famously includes a number of option extras provided by Q; front machine guns; revolving number plates; a bullet screen; and an ejector seat that prompted Q to tell Bond ‘I never joke about my work’. 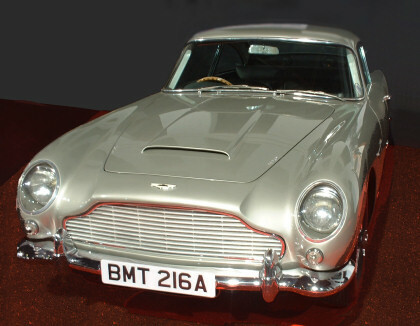 The Aston Martin DB5 was also used in Thunderball (1965). It was reintroduced 30 years later in Goldeneye, and also appears in Tomorrow Never Dies and Casino Royale. The DB5 is a classic in a Bond movie. I like.